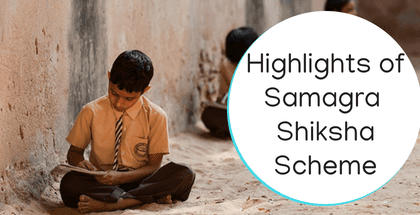 Samagra Shiksha is a name of integrated scheme for school education launched by the Union Ministry of Human Resource Development (HRD), government of India. The scheme covers from pre-school to till Class 12. Under this scheme union government extends support to states from pre-school to senior secondary levels. Thus three schemes which took care of the school education at primary and secondary levels — and Teacher Training will now be coalesced into one whole. The Scheme will support ‘Operation Digital Board’ in all secondary schools over a period of 5 years, so as to enhance the use of digital technology through smart classrooms, digital boards and DTH channels. CWSN (Children With Special Needs) girls from Class I to XII would be given a stipend of Rs. 200 per month. To focus on the importance of libraries, schools would be given an annual grant of Rs. 5,000 to Rs. 20,000 under the initiative. The Digital initiatives like ShaalaKosh, Shagun, ShaalaSaarthi will be strengthened. Under this scheme a competition over myGov to design an apt logo for the scheme which signifies a holistic approach for holistic development of children.